The theoretical principles of inelastic phenomena in solids were formulated for the first time by C. Zener in 1937 – 1938. Virtually at the same time N. N. Davidenkov formulated the principles of the nonlinear mechanics of materials. Special literature operates with various terms for describing inelastic phenomena in solids, for example, internal friction, physical acoustics, absorption of ultrasound, static and dynamic hysteresis loops, internal dissipation of energy, and damping of oscillations. In 1990 De Batist and Magalas suggested a generalized concept for the description of these phenomena known today as mechanical spectroscopy of materials. Mechanical spectroscopy (MS) studies absorption spectra of mechanical energy under the conditions of applied periodic external mechanical field. The problem is regularly discussed at international and domestic symposiums and conferences. In Russia the study is coordinated by the Ioffe Physicotechnical Institute of the Russian Academy of Sciences, Voronezh State Engineering University, and Tula State University. Depending on the nature of the perturbing field F, mechanical spectroscopy analyzes the absorbed or emitted energy for various models of the system involving the perturbation source (F ), the physical object (S ) subjected to the action of the perturbing field, and the response (R ) (see Fig. 1). The external perturbing field and the physical object determine the response R, the method of its determination, and the experimental method. The external perturbing field (F ) causes a new equilibrium state that appears noninstantaneously, which explains why the corresponding relaxation time is not zero. There is a time lag between the response and the perturbation; under periodic loading this gives rise to a hysteresis loop in the coordinates R = f (F ) (at ultimately high frequencies the F and R of the system do not have enough time to interact). Since the hysteresis is accompanied by energy dissipation, the generalized modulus (or “compliance”) of the system can be determined quantitatively from the relation. If F is the stress and R is the strain, the response function reflects the complex modulus of elasticity M (or rigidity) of the system. If F is the strain and R is the stress, the response function represents the compliance J of the system at M = 1/J. where is the phase angle between the stress and the strain, is the logarithmic decrement of the oscillation, is the relative energy dissipation per oscillation cycle (the damping capacity), is the dissipated energy, W is the energy of mechanical oscillation of the system, is the coefficient of absorption of ultrasound, and is the wavelength. In general the MS response in a solid body is represented by the elastic M(J ) and inelastic characteristics of mechanical oscillation. Problems of the theory of inelastic phenomena in metals and alloys were considered in detail and classified in the Russian literature in  in 1964. It was shown that in actual solid bodies the stress and the strain are related through a time dependence and the strain is representable as the sum of two components, i.e., in , where is the inelastic (additional) strain that attains equilibrium with time (quasi-elastic strain). On the whole, and are the components of inelasticity shifted by relative to the applied field. They depend on the time, frequency, and temperature; for nonlinear systems they also depend on the value (amplitude) of the stress. 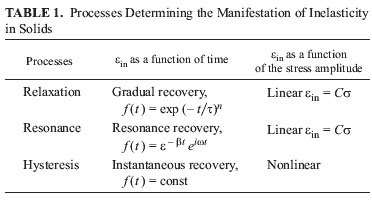 The laws regulating the variation of the additional strain with the stress amplitude and time have made it possible to classify the inelastic phenomena in solids (see Table 1). 1. M. A. Krishtal, Yu. V. Piguzov, and S. A. Golovin, Internal Friction in Metals and Alloys [in Russian], Metallurgizdat, Moscow (1964).